Pictured (from left) are: Laura Schloesser, Milwaukee County Parks; State Rep. David Bowen; Rayna Andrews, Office of the Milwaukee County Executive; County Supervisor Supreme Moore Omokunde; Cecelia Gore Brewers Community Foundation; Susan Lloyd, Zilber Family Foundation; and John Bernaden, Rotary Club of Milwaukee at the ground-breaking on Saturday, June 27, 2015. On Saturday, June 27, 2015 The Rotary Club and other community organizations held a ground-breaking at Johnsons Park. The park project located at 1919 W. Fond du Lac Ave., in the Lindsay Heights neighborhood, is just the first phase of a major revitalization of the Lindsay Heights area. The Rotary Club understands that strong communities contribute to a healthy business environment, said John Bernaden, President of the Rotary Club of Milwaukee. Future changes to Johnsons Park will promote a mix of passive and active recreational activities designed with building a stronger, healthier community. Planned improvements include sports fields, tree-lined pathways, benches, and a performance stage. Bike racks, energy-efficient lighting, and a bioswale to help manage stormwater onsite will be included to conform to the county’s sustainability efforts. All improvements will be completed by the fall of 2015. 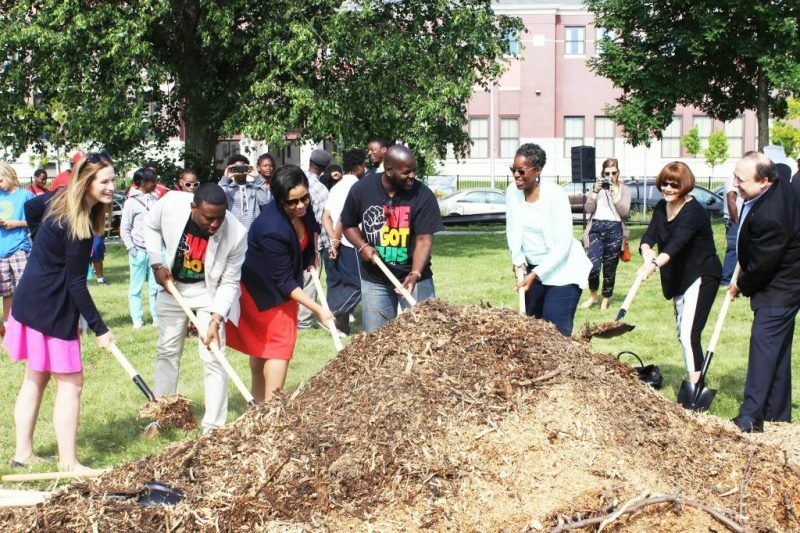 The total public-private partnership investment in Johnsons Park is $1.2 million; the park project is part of a broader $3.2 million initiative that included improvements to Alice’s Garden and the Brown Street Academy schoolyard. For more information, visit partner websites at www.resilientcities.org, milwaukeerotary.com, and www.countyparks.com or call (414) 257-PARK (7275). The 2nd Annual An Evening of Elegance Black Tie Affair.